My latest fragrance crush has to be the newly launched fragrance by Anna Sui. Meet Fairy Dance*, the box is very eye catching and bright. Adorned with a plethora of flowers, the box even shimmers like fairy mist adding to the whole experience. The bottle is 3-sides reminiscent of the original Secret Wish bottle. The bottle is adorned with a fairy on the top! The fragrance is a soft peachy shade making it very feminine and alluring. The combination of the notes gives the fragrance a playful magical seductive charm, a must for all ladies. Overall I adore the packaging, this is definitely a perfume which would catch my eye. I love the scent even more, I've been using this perfume daily since it joined my little perfume collection. It's the perfect daily scent which can be worn all year round. Have you seen Fairy Dance? Oooh this sounds amazing! I love the original blue one of this. Infact all Anna Sui perfumes are pretty amazing! I also love the fairy design bottle, such a lover of anything fairy! 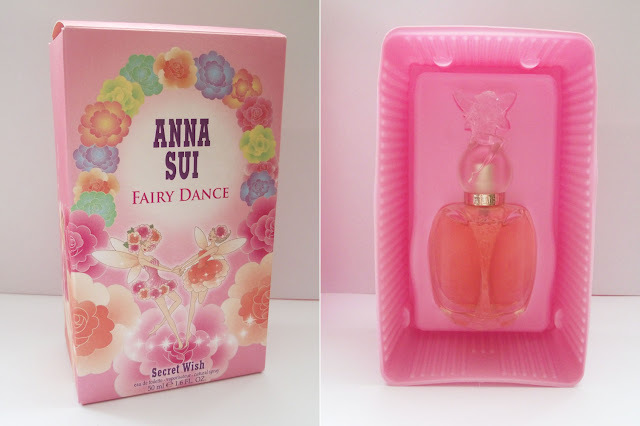 I also use Anna Sui's perfume! there are information about gel nails and reviews on cosmetics. good blog! keep on reading it! we also have a blog, http://aguide4thekids.blogspot.com.ar Come, visit us and comment on whatever you want!